Dragon Dice is a collectible dice game originally made by TSR, Inc., and is published today by SFR, Inc. It is one of only a handful of collectible dice games produced in the early 1990s. In 1995, Dragon Dice won the Origins Award for Best Fantasy or Science-Fiction Board Game. The races and monsters in Dragon Dice were created by Lester Smith and include some creatures unique to a fantasy setting and others familiar to the Dungeons & Dragons role-playing game. The game simulates combat between armies of fantasy races for control of a young world named Esfah. Dragon Dice classifies magical power by element: air, earth, fire, water, and death. Nearly every race in the game is composed of two of these elements. In the original edition, dragons and dragon-related dice (Dragonkin) were all composed of a single element each. However, SFR has since released "hybrid" dragons representing each two-element combination, in addition to white and ivory dragons (where ivory represents no elemental affinity and white represents affinity with all elements). Dragon Dice is set in the fictional world of "Esfah." Esfah was created by the goddess Nature, and the Father of All. These two deities had several children, each of whom represented one of the major elements described by Plato (Fire - Firiel, Earth - Eldurim, Wind - Ailuril, Water - Aguarehl), and one of whom was named "Death." After Nature's children created two races, the Coral Elves (Selumari) and Dwarves (Vagha), Death created its own set of races, the Goblins (Trogs) and Lava Elves (Morehl), bent on causing mischief and discord. Nature and her children became enveloped in a continuing war with Death, each causing the birth of several new races, including the Amazons, Firewalkers, Undead, Feral, Swampstalkers, Frostwings, Scalders, and Treefolk. The Eldarim were introduced as a complete race in August 2009. 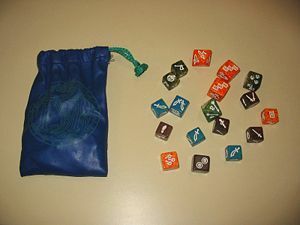 Players then use their dice to represent either the forces of Good or Evil in this setting (although there is no compulsion to play one or the other). The goal of a standard game of Dragon Dice is to capture two of the three terrains being fought over. This is achieved by one player's armies controlling two terrains that have their terrain die turned to the eighth face, as explained below. The game can also be won if a player has the last surviving unit(s) in play. Any number of players can share in this struggle. Any six-sided dice or ten-sided dice (see Monsters, below) that belongs to a race is a unit. The color(s) of the dice identify each race and represent the elements that comprise each. The dice come in four sizes, each corresponding to a particular amount of "health" from 1 to 4 points. One side on each unit die has an ID icon, which identifies the unit and generates results equal to the health of the die towards whatever action is being rolled for. The remaining sides have either normal action icons (representing magic, maneuvers, melee, missiles, or saves) or special action icons (SAI) that generate special effects or results. Generally, the more health a unit has, the more icons it will have. Units are also divided by class as well as size, reflecting their specialty. Most races have five classes of unit, plus monsters (or champions for the Eldarim), but while most races share a number of classes (Cavalry, Magic, Melee), some are unique to certain races (Light Magic, Light Melee, Light Missile). MONSTERS are ten-sided dice that are units and have a single icon on each face which generate 4 points of effect (i.e. : 4 results) with the possible exception of some SAI effects. Monsters are part of a player's army and each one counts as four points of health. Players build armies of units to a predetermined amount of health. The standard game is 36 points of health, but smaller and even larger games are not uncommon. There are other six-sided dice that are mono-colored called Dragonkin that are not considered units. There are other ten-sided dice that are mono-colored called artifacts that are a type of magic item. Both are part of the Advanced Rules. TERRAINS are eight-sided and have two colors that indicate of what elements the terrain is composed. For example, a Swampland terrain is green and gold, showing it is made of earth and water. Each face of a terrain dice is numbered and has an icon for missile, melee, or magic. The number and the icon shown indicate how far apart armies at that terrain are. If a Magic icon (starburst) is showing, then the armies are so far apart they can only cast spells. A Missile face (arrow) means they are close enough to shoot at each other, and a Melee icon (sword) means they are close enough for hand-to-hand combat to take place. Each player brings two terrains to the game, one Home terrain and one proposed Frontier terrain. Some races gain benefits such as extra maneuvers or saves if they are at a certain terrain. The goal of the game is to control two such terrains by "turning" them to the 8th face. An army capturing an 8th face also gains double maneuvers and double saves. The eighth face of terrains has one of four special icons: City, Temple, Tower and Standing Stones. Each gives an additional bonus to the army that possesses them. EXAMPLES: An army with a Temple is immune to the effects of Death (black) magic and can "bury" dead units to render them unusable for magic. A City allows for the recruiting or promoting of units, a Tower allows for a Missile action to any other terrain, and Standing Stones allow that army to cast magic of that terrain's color, even if the army is not made up of those colors. SFR released the "Battlefields" expansion in August 2010, featuring two new terrains: Feylands (green/red) and Wastelands (blue/red). Four new 8th face icons were also introduced that can only be used at the Frontier location: Dragon Lair, Grove, Castle, and Vortex. Minor terrains (smaller eight-sided dice) were re-released as part of this expansion. DRAGONS are twelve-sided and of a single color. Each face has the image of a dragon part that will show what action the dragon takes when rolled against an army. Dragons must be summoned to a terrain through the use of magic. Players do not control dragons they summon, so bringing one into play can be risky since the possibility exists that it may attack the very player that summoned it. One dragon is brought to the game for every 24 health of units in play. Thus, in a 48 health game players would bring two dragons. SFR has released ten 2-colored HYBRID DRAGONS, 5 Ivory/color hybrid dragons, and a white dragon in both wyrm and drake forms. With the advent of these hybrid dragons, the total number of dragons is 44; 5 each of elemental wyrms and drakes, 10 each of hybrid wyrms and drakes, one eack of ivory wyrm and drake, and one each of white wyrm and drake. 2009: "Dragonkin Expansion" re-releases the Dragonkin, which are 6-sided one-color units that can be summoned to a terrain and fight with the army there. Dragonkin come in 1-health commons, 2-health uncommons, 3-health rares, and 4-health Dragonkin Champions. Dragonkin will not fight against a dragon of the same color. For every full three points of other units a player brings to a game, he is allowed (but not required), to bring one point of dragonkin. Dragonkin are part of the Advanced Rules and start in the Summoning Pool. 2010: "Battlefields" includes two new basic terrains types, the Feylands (Fire and Water) and the Wastelands (Fire and Air). The terrains printed in white ink have the same four 8th Face types (City, Standing Stones, Temple, Tower) and are a part of the basic game. Also released as a part of this expansion are minor terrain versions of these new terrains (as well as Coastlands, Flatlands, Highlands, Swamplands). These minor terrains represent lesser objectives that may give your army a needed boost if you're willing to take a risk. Minor terrains are part of the Advanced Rules. The Battlefields expansion also contains special terrains printed in gold ink with new 8th Faces: the Dragon's Lair, Grove, Castle, and Vortex. These special gold-printed terrains can only be placed at the Frontier. They can never be home terrains, so there will only be a maximum of one special terrain in play during a game. Otherwise, special terrains act just like normal terrains, except than their icon progression is set by the eighth face icon, not by their elemental colors. 2011: "DragonCrusader and DragonZealots" are Eldarim Champions (along with DragonLords / DragonMasters and DragonSlayers/DragonHunters) and have the ability to control dragons. Each DragonCrusader or DragonZealot that rolls its SFR logo allows the acting player to control one dragon. The dragon may be held motionless (i.e. : it is not rolled) and the army can attack it normally. Or the dragon may be made part of the attack against other dragons. Each of the races of Dragon Dice has unique icons representing the basic action types - for instance Missile is a bow for Coral Elves, a slingshot for Goblins, and a flintlock pistol for Lava Elves. Each race also has access to different special icons on their rare or monster units. Beginning with Firewalkers, each later race also had unique spells using their magic color that only they could cast. Coral Elves (blue and green) are peaceable sea-dwelling elves who travel in flying "coral ships". Dwarves (red and gold) are stalwart warriors with horned helmets, two-headed axes and shields. Goblins (gold and black) are disgusting, ravenous creatures who ride wolves or leopards and cast curses. Lava Elves (red and black) are fierce death-mages who wield pistols and rapiers. Firewalkers (blue and red) are warriors from the sun who flew to Esfah to join its battles for sport. Undead (black and ivory with green icons), the reanimated dead, can use only death magic. Ferals (gold and blue) are various races of humanoid beasts or birds who fight with stone knives. Swamp Stalkers (green and black) are hideous snake-people who mutate other races into themselves. Scalders (red and green), the only "kicker" produced by Wizards of the Coast before the game's production ceased, are twisted, malicious faeries and can harm those who attack them. Treefolk (gold and green) were printed by SFR after they acquired the abandoned licence. As they use the last unique combination of the game's five colors, additional multi-colour races are unlikely. Eldarim are the original race of Esfah, and are represented by single colour promo dice called Champions, worth four health each. In 2009, SFR released a new expansion called "Acolytes of Eldarim," single colour units of one to three health who have given up their racial heritage to learn from the Eldarim Champions. This "kicker" includes a new class of unit, the Shield Bearer. Before the start of the game, units are divided into three separate armies, Home, Horde and Campaign. Each starting army must have at least one die, but no more than half the total health of the entire army (but this restriction only applies to the starting set-up and no longer applies after the game begins). The Home army defends a player's Home terrain, the Horde army is placed at an opponent's Home terrain, and the Campaign army is placed at the Frontier. Before the start of the game, players roll their Horde armies, and the player with the most maneuver points may choose the Frontier terrain, or to go first. On a player's turn, one is allowed two marches, or actions, with their armies. What action they may take depends on what icon is showing on the terrain face. However, a single army may not take two marches in the same turn. EXAMPLE: A player has pulled all of their units into a single army at one terrain. On their turn they get only one march with that army. Before taking an action with their army, a player may choose to attempt to move the terrain face up or down. They announce this, and if unopposed, change the terrain. If an opponent at the same terrain wishes to oppose the move, then both players roll their army, counting maneuver and ID icons for the total number of points rolled. If the acting player's total is equal to or exceeds the opposing player's total, then they win and may turn the terrain die one face up or down. EXAMPLE: The terrain is a Coastland at 5, a missile face, and the player has a mostly melee army. By rolling to maneuver, and generating more maneuver and ID icons than any declared oppoents, the acting player may turn it to 6, a melee face, which allows them to skirmish or charge their opponent. If the terrain face is a Magic icon, a player may attempt to cast magic and roll their army, counting magic icons and IDs. Those dice on which an ID is rolled may double their magic total if they match at least one color of the terrain. After tallying points, the acting player may cast spells to help their own armies or hinder an opponent's. Spells are assorted by color, and have varying effects such as inflicting damage, adding protection, or even summoning a dragon. While at a terrain with a Missile face, the acting player can choose to shoot at an army at the same terrain or at the frontier. The army is rolled and all missile and ID icons are counted for the total number of hits. The targeted army is rolled for saves, and if enough saves are not generated, units are removed from the army and sent to the Dead Unit Area (DUA). The targeted player does not get to roll a return shot. EXAMPLE: the acting player rolls 5 missile icons and 2 IDs for 7 hits. The targeted player rolls only 4 saves, so would send a total of 3 health of units to the DUA. At a terrain with a melee (sword) icon showing, the acting player can choose to engage their opponent in a skirmish. The army is rolled, and all melee and ID icons are counted for the total number of hits on the targeted army. That army is then rolled for saves (like in a missile attack), and if enough saves are not rolled, the appropriate number of units are sent to the DUA. The targeted army then rolls for a counter-attack against the acting player's army, who must then save against the attack or send units to the DUA as well. EXAMPLE: The acting player declares a skirmish and rolls his army. He rolls 4 melee hits and an ID icon on a two health unit, for a total of six melee hits. The opposing army rolls for saves and generates four saves. That army would immediately lose two health worth of units. After choosing what unit(s) to remove, the opposing army now reciprocates by rolling for melee hits, and the original acting army makes a save roll. Alternatively, the acting player may choose to engage in a charge attack. In a charge, the attacking army is rolled and all melee, maneuver, and ID icons are counted as hits (icons such as trample, which count as either maneuver or melee, in this context will count for both and are therefore worth double). The defending army is rolled at the same time, with saves tallied to block opposing hits and melee hits tallied to inflict damage on the attacking army, which cannot roll saves of its own. EXAMPLE: The acting player declares a charge and rolls his army. She rolls 5 melee hits, 2 maneuvers, and 3 trample icons. Simultaneously, the defender rolls 6 saves, 3 melee hits, and 3 trample. The acting player tallies 5 melee + 2 maneuver + 6 trample (3 melee PLUS 3 maneuver, as the trample counts for both) for a total of 13 hits. The defender saves against 6 of these hits, taking 7 damage, AND hits back against the charging army for 6 damage (3 melee hits + 3 trample - the maneuver aspect of trample does not count as hits for non-charging armies). Ultimately, the acting army will remove 6 health of units to the DUA, and the defending army will remove 7. When a player has taken both marches, they may withdraw any number of units from terrains into the Reserves area. These units may then be sent to any terrain at the end of the player's next turn during the Reinforcement phase, but before others are withdrawn into the Reserves. Units in the Reserves may take a march, but they may not maneuver a terrain and are limited to attempting friendly magic (they cannot target an opposing army or affect a terrain). The one exception to this is Amazons, which may take a missile action to their Home terrain or the Frontier while in reserves. Some units and monsters have SAIs (Special Action Icons). For example, a CANTRIP icon allows for up to 4 points of magic during any action other than maneuvers that can be used immediately. A BULLSEYE icon rolled during a missile action targets an individual unit that must for saves before the targeted army does. The SMITE icon inflicts up to 4 hits on a target army, who cannot save against them and must remove that many health from the army before rolling for saves. A player wins by maneuvering two terrains to the 8th face, or through attrition by removing all of an opponent's pieces from the game. Dragon Dice was released in 1995 as a part of TSR's 20th anniversary. TSR produced the starter races and several expansion packs, printing a total of eight races and several promotional dice for the game. After TSR's purchase by Wizards of the Coast, one additional race was created. Three paperback novels were written for the game. The first titled Cast of Fate by Allen Varney in 1996. The book was 310 pages and contained a new ivory Dragonslayer die contained in a hole cut through the pages of the book in the bottom right corner with all text arranged to accommodate the hole. The second was Army of the dead by Edo Van Belkom in 1997, also with a dragonslayer die in a hole in the book. A third novel titled Time of the Champions by Ed Stark was advertised but apparently never published. A large gumball machine was erected at GenCon that dispensed a Red or Blue Dragonlord die. A computerized version was published in 1997 by Interplay. Wizards of the Coast sold the game to SFR, Inc. on the verge of disposing of a large number of unsold dice into a German landfill. As of 2008, SFR has produced a tenth race and completed two sets of promotional dice.